Would you drink wine from a can? Should you? Wine in a can? Sure. Let's do this! Our neighbor, Christine the Pie Queen, relayed the results of a bit of work-related research performed by her loving hubby Jeff, both of whom you may remember from several write-ups over the years (including the ever-popular “Jeff’s Dinner Club” series). Jeff had uncovered a series of videos produced by Union Wine Company in Oregon for their Underwood Pinot Noir. As I usually do when there are oenological curiosities like this, I hit up the PR contact for Underwood to ask for review samples. Most companies are pretty good about sending along tasters for me to try. Underwood, however, informed me that press samples were not available “due to high demand.” In my mind, that either meant that they’re moving so much volume that they don’t need reviews to generate interest – or perhaps they don’t want reviewers looking too closely. Or maybe they just don’t have any to spare. The Sweet Partner in Crime and I invited Jeff and Christine to Vine HQ for a “scientific comparison” of the various Union Wine offerings. 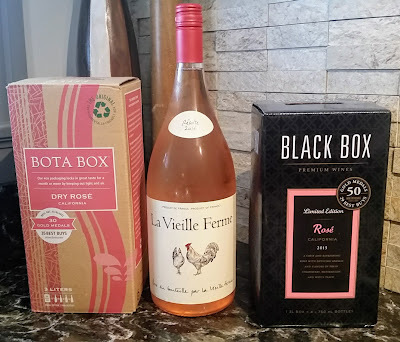 To establish a “cross-inexpensive-vino” comparison, we also poured some Bota Box Pinot Noir because, well, it was cheap and we had it around. We took up our places around the living room and began to carefully pour, swirl, and…oh, who am I kidding? We commenced to pounding pinot whilst taking notes. We started with the cans, of course. The unmistakeable “pffft” of opening aluminum proceeded pours all around. (We did our best to emulate the various characters from the videos as we tried the stuff.) Our first impression – this wine ain’t bad! It’s not the rich, earthy Oregon pinot that I can get all William Burroughs about (as in “If God made anything better, he kept it for himself…”), but the basic flavors certainly are along the lines of a solid, inexpensive Oregon wine. The can label helpfully suggests: “Notes: Raspberry, Cherry, Chocolate.” The actual flavors are pretty much along those lines. For wine that you can schlep in a cooler or backpack and slap a koozy on, it’s quite decent. For a picnic or other outdoor activity where glass isn’t practical, I’d consider it certainly workable. It’s also miles better wine when compared to the Bota Box, which tasted heavier, thicker, and sweeter than the Underwood. We also had a tableful of snacks to go alongside our wine: Christine’s Caprese Skewers with homemade squeaky cheese; Jeff’s Smoky Baba Ganoush; and some dry sausage, gouda, and crackers. The wine went well enough with the entire spectrum of flavors, so it should be workable with nearly everything. As I mentioned, we poured the wine into glasses to sample it, but I was the first of the group to step up and take a big ol’ chug straight from the can. In all honesty, I can’t recommend that particular technique. Since so much of wine’s flavor is scent, you get nothing aroma-wise when you drink it like a Coors Light, so make sure you pour it into some kind of available container – glass, mug, Solo cup, what have you – for best results. Interestingly, we discovered that the canned and bottled Underwood pinots are completely different wines. The bottle’s label reads, “Notes: Cherry, Blackberry, Cola.” As I mentioned already, the Underwood in a bottle has a vintage, which means that all of the grapes were harvested the same year. The canned wine is non-vintage, meaning that it’s a blend of grapes or wines from different years. My guess is that the can wine is the “leftovers” at the end of a bottling run from a couple of subsequent vintages, but I’m not for certain. In any case, the bottled version of Underwood pinot is, by unanimous consent of our little foursome, a superior wine to the canned version, even though the price is basically the same. The fruit is brighter, there’s a nice smoky flavor that I liked, and there’s better balance overall. It’s very good for a $12 pinot. We then poured some of the King’s Ridge for price point comparison purposes. The King’s Ridge, while somewhat more expensive than the Underwood, proved to be a bit of a disappointment. The flavors were darker and heavier, but that didn’t make them more interesting. In fact, when we compared the Underwoods to the King’s Ridge, which also has “Notes: Cherry, Blackberry, Cola,” we ranked them: Underwood bottle, King’s Ridge, Underwood can. In short, I wouldn’t bother with the King’s Ridge. There are better pinots out there for around $20. 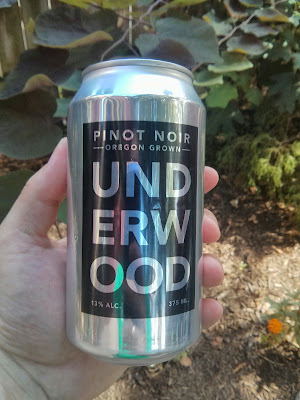 As an addendum, a few days later, the Sweet Partner in Crime and I tried a can of the Underwood Pinot Gris. Again, a decent enough white (notes: peach, grapefruit, and pear). It’s much more interesting than most inexpensive pinot grigio. I thought it had an odd yeasty scent that faded as it got some air. It’s certainly dangerously drinkable on a hot day. Underwood also is releasing a rosé, which I have not tried yet. Bottom line – Underwood is a quality wine for any occasion where a can is your best beverage delivery option. It’s worth a try. After our recent spin through some of their new organic Chilean wines, I had the chance to try a few bottles from Emiliana Winery’s “Novas” line. “Novas” means “new” in Latin – and is the astronomical term often used for an appearance of a new star. The Novas wines, according to Emiliana, are their line of smaller production wines, each highlighting grapes from a particular Chilean growing region. I received three bottles of the Novas, each labeled “Gran Reserva.” In some countries or growing regions, a “Reserve” wine can mean any number of things – such as the length of aging, types of fermentation, grape harvesting techniques, etc. I wanted to know what this meant for these South American selections. “Organoleptic,” according to good ol’ Merriam-Webster, means “acting on or involving the use of the sense organs.” Thus, a wine with “distinctive organoleptic characteristics” has…well…good flavor, as defined by the winery. Generally, “Reserva” will refer to the better wines made by a particular winery, but there’s not a consistent standard. However, “Gran Reserva” (as well as the terms “Reserva Especial” and “Reserva Privada”) does have a particular definition. If a Chilean wine is labeled as “Gran Reserva” – then it means that it should be a good-flavored wine that’s at least 12.5% alcohol and has been treated in some way with oak. Allow me to share with you my organoleptic observations of this set of Gran Reserva wines, all of which are available in the neighborhood of $16. Emiliana 2014 “Novas” Gran Reserva Sauvignon Blanc – This 100% sauvignon blanc is from the San Antonio Valley, a coastal valley about halfway down the west coast of Chile. Cooling breezes from the sea allow for slow-ripening grapes like sauvignon blanc and pinot noir to thrive. In this particular bottle, I thought the nose was very reminiscent of a New Zealand Sauvignon Blanc with similar grassy, grapefruity aromas. I found it quite tart at first taste, with more of that grapefruit flavor, which included a little bit of a rindy bitterness. The body is medium-weight with a mineral-flavored backbone which prevents it from dropping into acid-ball land. The finish is crisp and acidic, with a peach note hanging on at the end. If you’re into EnZedd Sauvignons, you’ll probably get a kick out of this. If you’re more on the fruitier, more tropical sauvignon blanc end of the spectrum, I’d suggest you give this one a pass. Emiliana 2012 “Novas” Gran Reserva Cabernet Sauvignon – I thought this was a very interesting little cabernet. It’s from the Maipo Valley, just inland from the San Antonio Valley. Maipo is one of the primary grape growing regions in Chile. In general, I’ve found many Chilean reds lean towards the juicy end of the spectrum. In this case, I was pleasantly surprised when I found a more brambly, Old-Worldish flavor waiting in my glass. Sure, there’s lots of fruit – blackberries and currant especially – but I thought it also had a good earthy backbone. “Grubby” was the word I used when I poured it for the Sweet Partner in Crime, and our resident “dirt drinker” concurred. The earthy edge smooths a bit as the wine gets some air, but it’s not a one-note fruit bomb. I would certainly recommend it, and I thought it was pretty darned nice next to a marinated London broil that I’d grilled up. Emiliana 2012 “Novas” Gran Reserva Pinot Noir – A very straightforward pinot noir from the Casablanca Valley, which is located just to the north of San Antonio on the coast. Casablanca is also known for cool-climate grapes like pinot noir, as well as clean, crisp chardonnays. With the cool climate, I expected a little more smokiness and depth, but I was struck first by the fruit. Full cherry aromas get you right off the bat – aromas that are mirrored by the flavor on the palate. There’s definitely a smokiness, as well, but the fruit that goes with it isn’t overly complex. The cherry continues into some fairly strong, at least for pinot, tannins. If you’re looking for an easy drinking wine that’s got the good basic bones of pinot noir, it’s workable. If you’re looking for a subtle complex pinot, this isn’t really your wine. We opened this on a night not long after that we got home from vacation – and we powered through the bottle fairly quickly. All in all, I do think these are slightly higher in quality than the first set of Emiliana wines, and the price point is just about right, especially for the cabernet.